Local Mum Andrea has used her experience as a teacher and her love of music to create a popular children's music class in our area. 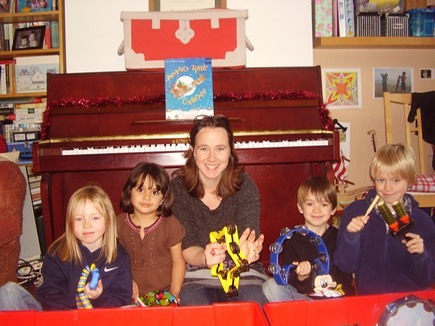 Local Mum Andrea Milne has found her perfect job running the hugely popular Musicbox classes in Carshalton. Andrea gave up her job as a primary school teacher and Music Coordinator after the birth of her second child but was keen to use her skills to help her own - and other - children experience the joy of music. "As a teacher and music coordinator I saw how important music is for children's development and self esteem," explains Andrea. "I was really keen to introduce my own children to it as soon as possible." After attending Musicbox classes with her children Andrea was so impressed that she took over the franchise as soon as an opportunity came up. "I had been to other music classes but particularly liked Musicbox," says Andrea. "The classes seemed more intimate and there was an excellent selection of unusual puppets and musical instruments." "I was delighted as I could combine my love of music with working with young children," adds Andrea. �"Running my own business has been a steep learning curve but knowing I am doing something I love and something which I believe to be important to children’s lives makes it all worthwhile!" However Andrea's parents' passion for music rubbed off on her. �"My mum loved classical and my dad was a dedicated Elvis fan!" Andrea also taught herself to play piano and guitar and currently belongs to Sutton music rock choir which she attends with a couple of other mums. "This doesn’t mean I am X Factor material but I just love singing!" laughs Andrea.